We went to open a bank account in the town today. We thought it best to do the sensible thing and be a little more part of the community and all that. Plus it's easier having a bank in the town, so C & I opened an account at one of our local branches. Nice and easy it didn't take long at all. Then the turkeys came into it! When I last opened a bank account here on the island, I received - as a free gift - a bottle of Tunel. Horrible stuff, a little like Pernod, but C likes it. This time however, we got a turkey!!! No, not from the bank. After the bank trip, the three of us (C, J & myself), decided to pay a visit to the poultry farm in Ariany to look at turkeys for Christmas. Now being the time to buy them so they are nice and fat for the Christmas table! 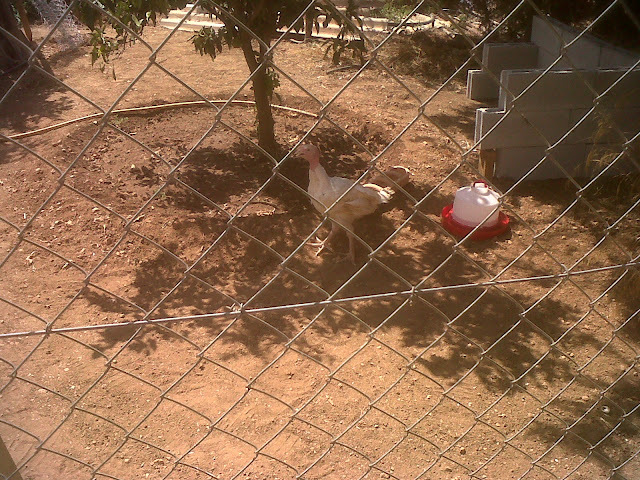 When we arrived we expressed our interest in seeing some turkeys, how much were they? and what was the availability? We were not buying one now, you see. It transpired they were only 7€. We'll take one. Damn, I've done it again!! The farm was huge and C fell in love with it. If we do the lottery and win, we should buy something on this scale, I mumbled over the noise of the guinea fowl, ducks, turkeys, chicks, goats, rabbits, dogs and cats and pigeons! The owner showed us around. In one field there were hundreds of guinea fowl with their beautiful plumage and a couple of goats, one of which was up an old almond tree. I don't think I'd ever seen a goat up a tree! Has anyone else? On the drive home we realise, in typical 'us' fashion, we have nowhere to house it and no pen for it. You are not supposed to have turkeys and chickens together - apparently due to exchange of disease. It can't roam free because the dogs will eat it, so we decided on an area at the bottom of the orange grove. The trouble was that it was not fenced in. So, on the way back we stopped off at the Cooperativa to pick up 7 wooden posts, a feeder and water container, we had some spare chicken wire at home which was good. Once home, C began work enthusiastically in the 40 degree heat - FOOL! and I realise that one turkey is going to be quite lonely with out a pal! I suggested to C that we should get Humphrey (I know, never name them) a companion. Several hours later, while C is finishing the pen, J and I go to buy turkey no.2 (now known as Mr Spock, Captain Kirks' no.2 - we aren't Trekkies by the way). During our absence, Ma arrives with refreshments - essentially beer for C. Whilst sitting in the kitchen chatting, C asked Ma to view our latest acquisition. On going outside C shouts furiously at Rex (our big Mallorcan dog) who is in the newly made turkey pen. Stupid man didn't tie the gate up!!!!!! With Rex out of the way, Ma saw Ruffa (our bouncy, young boxer) with Humphrey in his jaws. Jesus Christ! we've only just bought the bird. C legs it to the front of the house so he can race round to the back and try to save our turkey. After a sharp talking to and a 'slight scuffle', Ruffa concedes the point and lets Humphrey go. Apparently. For the next 12 hours or so, Humphrey is a bit subdued but none the worse for his experience. So now we have two turkeys for Christmas. Which one will we eat first? Whose going to do the dirty deed? Are we actually going to eat them finally?